Over the past four months, Myanmar’s armed forces, officially known as the Tatmadaw, have driven over 600,000 Rohingya Muslims into Bangladesh, killing thousands of civilians in the process and prompting the United Nations High Commissioner for Human Rights to label the army’s actions “a textbook example of ethnic cleansing” and possibly genocide. One might expect this situation to fall squarely within the ambit of the International Criminal Court (ICC), but the case remains conspicuously absent from the Court’s docket. The reason the ICC Prosecutor has not opened an investigation is simple: Myanmar is not a party to the Rome Statute, significantly limiting the Court’s jurisdiction over crimes within Myanmar’s territory. The UN Security Council can refer situations to the ICC concerning non-states parties, but China would undoubtedly veto any such resolution. Nor is it likely that Myanmar will accept jurisdiction unilaterally. The only remaining jurisdictional basis requires identifying conduct either on the territory, or perpetrated by a national, of a state party. But the conflict does involve actions by a non-state party – Myanmar – that have carried over onto the territory of a state party to the Rome Statute: Bangladesh. This cross-border activity could provide the basis for territorial jurisdiction, which the ICC lacks over conflicts that take place entirely within countries that are not members of the Court. Asserting this form of territorial jurisdiction would be consistent with the meaning of the Rome Statute and would advance the Court’s purpose of preventing impunity for grave international crimes. Within three weeks after the Arakan Rohingya Salvation Army’s (ARSA) Aug. 25 attack on Myanmar army and police outposts, satellite imagery indicated at least 200 Rohingya villages in Rakhine State had been burned. Around the same time, reports emerged of Myanmar armed forces raiding Rohingya villages and “murder[ing] scores of people.” Before the ARSA attacks, approximately 300,000 Rohingya lived in refugee camps just over the border from Rakhine State in Bangladesh. Since then, over 600,000 more Rohingya have fled to Bangladesh, totaling over half the Rohingya population believed to have been living in Myanmar. Deportation need not involve physically transporting individuals across a border. The Article 7(1)(d) Elements make clear that “[t]he term ‘forcibly’ . . . may include threat of force or coercion, such as that caused by fear of violence.” Likewise, the ICC Trial Chamber in Prosecutor v. Ruto held that, in order to establish deportation or forcible transfer, “the Prosecutor has to prove that one or more acts that the perpetrator performed . . . produced the effect to deport or forcibly transfer.” The Tatmadaw’s actions thus provide a textbook example of the indirect form of deportation that Article 7(1)(d) criminalizes. Furthermore, although it is not necessary for a state party’s domestic law to abolish activities prohibited under the Rome Statute in order for the ICC to prosecute those crimes, it is worth noting that Bangladesh explicitly criminalizes deportation as a crime against humanity under the International Crimes (Tribunals) Act (ICTA). Bangladesh enacted the ICTA in response to the 1971 War of Independence, when Pakistani forces drove millions of Bangladeshis into India, reinforcing the ICC’s authority to prosecute such crimes taking place in Bangladesh today. Unless the UN Security Council refers a situation to the Prosecutor, Article 12(2) of the Rome Statute provides that the Court may exercise jurisdiction in two situations: 1) “the State on the territory of which the conduct in question occurred” is party to the Statute, or, “if the crime was committed on board a vessel or aircraft, the State of registration of that vessel or aircraft;” or 2) “the state of which the person accused of the crime is a national.” Since the UN Security Council has not referred the Myanmar situation to the ICC and no state party national appears to be complicit, territoriality is the Court’s only viable source of jurisdiction. However, the Statute leaves unanswered whether the “territory” on which “the conduct in question occurred” covers the territory of multiple states in which the crimes occur, some of which may not be state parties. No ICC case has addressed this issue either. Thus, there is an open question of whether the Court could assert territorial jurisdiction over unlawful deportation from Myanmar into Bangladesh. One approach would be to treat an element of deportation as crossing a state border. Deportation is an inherently cross-border action that is dependent on – and is not complete until the deportees enter – another state. Thus, in the parlance of the Rome Statute, one could argue that deportation is “conduct” that necessarily occurs on the territory of both the deporting and receiving states. From this perspective, when Myanmar deports Rohingya civilians to Bangladesh, the conduct occurs in both of those states. A possible challenge to this interpretation is that “conduct in question” should be defined more narrowly to include only the underlying actions taken to effectuate a crime, not necessarily the results of those actions. 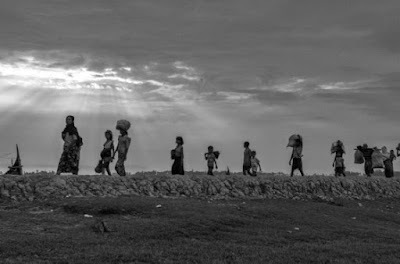 Since the Myanmar armed forces did not cross into Bangladesh themselves in effectuating the deportation, arguably the crime did not occur on Bangladeshi territory. This raises a second possible source of territorial jurisdiction: the state where the direct effects of the crime take place, even if no elements of the crime occur in that state. Traditional principles of international criminal law divide territoriality into two concepts: subjective territoriality refers to the location where the underlying actions of a crime occur, whereas objective territoriality refers to the location where a crime has effects. Based on these principles, even if an element of deportation does not cross a state border, the ICC could assert objective territorial jurisdiction over the situation in Myanmar given that the main effects of the crime have occurred in a state party. In terms of the Statute’s text, one could argue that “conduct” ought to be limited to the physical actions underlying a broader crime. Article 30, for example, distinguishes between conduct and consequences in addressing mens rea requirements. Likewise, Article 20(1) prohibits trying a person based on “conduct which formed the basis of crimes” for which he was previously convicted, indicating that “crimes” may have a broader meaning than “conduct.” But there are other reasons why each of these articles would distinguish between conduct, on the one hand, and consequences or crimes, on the other: in Article 30, to clarify that the perpetrator must intend the consequences as well as the underlying actions; and in Article 20(1) because the same actions and consequences can form the basis of different crimes. Evidently, as Michail Vagias argues in his book, the word “conduct” can mean different things in different contexts within the Rome Statute. In the jurisdictional clause, Article 12(2)(a), the “conduct in question” over which the Court has jurisdiction refers to a crime, which includes both underlying actions and effects. Article 12(2)(a) gives the ICC jurisdiction over the relevant crimes if they are committed in “the State on the territory of which the conduct in question occurred or, if the crime was committed on board a vessel or aircraft, the State of registration of that vessel or aircraft.” The wording of this clause suggests that “conduct in question” and “crime” are synonymous. Affording different meanings to these terms would create the strange result of permitting objective territorial jurisdiction over sea-and air-based crimes, but not over those carried out on land. If the Statute does not fully resolve whether “conduct” encompasses the effects of a crime, the principles and rules of international law are clearer. In the Lotus case, the International Court of Justice (ICJ) found that Turkey could assert jurisdiction over the criminal actions that led a French ship to collide with a Turkish ship because the effects of the crime occurred on Turkish territory, even though the underlying actions occurred on French territory. Furthermore, states view territorial jurisdiction as encompassing both subjective and objective territoriality as a matter of customary international law (CIL). For example, Restatement (Third) of U.S. Foreign Relations Law Section 402, which the United States views as reflecting CIL, provides that a state has jurisdiction over external conduct that has effects within the state’s territory. The general principles of law derived from national legal systems, including the “laws of states that would normally exercise jurisdiction over the crime,” support this view as well. China (Art. 6), Britain, France (Art. 113-2) (France requires that one of the “constituent elements” is committed on French territory), Germany, and the United States – to name just a few countries – all assert jurisdiction over both the underlying conduct and effects of crimes that occur on their territory. While Myanmar (Art. 179) leaves open to judicial interpretation whether courts can assert jurisdiction over crimes that originate abroad, its internal districts may assert jurisdiction if the crime produces effects in their territory. And although the Bangladeshi Penal Code (Art. 2) covers crimes committed “within Bangladesh” without specifically including or excluding objective territorial jurisdiction, other Bangladeshi laws do incorporate this form of jurisdiction. The Bangladesh Competition Act (Art. 3(m), 19), for example, extends jurisdiction over anti-competitive practices originating abroad that have effects in Bangladesh. Thus, there is no reason to doubt that Bangladesh accepts the general principle of objective territorial jurisdiction. To be sure, there are grounds for caution in applying objective territoriality under Article 12(2)(a). The ICC operates based on the consent of sovereign states, and treating the Court’s territorial jurisdiction as encompassing non-state parties in certain situations pushes the boundaries of that principle. However, the object and purpose of the Statute is “to put an end to impunity for the perpetrators of [grave international] crimes,” which counsels in favor of asserting jurisdiction where non-state parties take advantage of their status to commit international crimes the effects of which occur in state parties. Furthermore, the potential abuse of objective territoriality can be contained. Restatement (Third) Section 403 requires that the exercise of objective territorial jurisdiction be reasonable, which means the activity has a “substantial, direct, and foreseeable effect on the territory.” Such a standard would limit the extent to which the Court could assert territorial jurisdiction based on second-order effects of crimes originating on the territory of a non-state party. The crisis in Myanmar also satisfies the Statute’s other jurisdictional requirements. Article 17(1)(d)’s gravity requirement is likely satisfied given that over half of the Rohingya population in Myanmar – nearly 650,000 civilians – were displaced. Although the Court would not have jurisdiction over the violent acts both the Tatmadaw and ARSA committed in Myanmar, the sheer scale of the Rohingya’s deportation in proportion to Myanmar’s broader conflict is arguably sufficient to constitute a “situation,” as required under Article 13. And with respect to complementarity under Article 17(1)(a), there is no indication any other state is investigating these crimes – Bangladesh’s “Citizens’ Commission” would not qualify since it is not led by the state. Prosecuting crimes against humanity presents immense challenges far beyond meeting jurisdictional requirements, including evidence collection, identifying the correct perpetrators, and summoning the suspects for a hearing. These challenges are only amplified in states not party to the Rome Statute. Nonetheless, as a legal matter, lack of jurisdiction remains a central reason behind the ICC’s failure to formally investigate international crimes in Myanmar. Asserting objective territorial jurisdiction offers a way around that challenge and could help deprive human rights violators of a safe-haven, which they have used to injure nearly a million innocent civilians.